THE wheels of progress turn ever forward, but every now and then they get an added, if somewhat novel, boost from some hitherto unknown genius who labors in his back yard to make the wheels move for himself, and for himself alone. The photo at the upper left shows the tiny speedster in which Grant Withers defies the laws of gravity in “Penny Arcade,” a picture with a Coney Island setting. This little car was made by the studio property man from odd parts of various cars. John D. Lamey, of Hoquiam, Washington, who lives near the railroad but was required to walk five miles to town each day, decided that if the railroad would not furnish him with a train he would build one himself. Here you see the result. Four papier mache wheels, a bicycle frame and a few pieces of steel tubing, coupled with his inventive ingenuity, and Presto! The one-man train was developed. 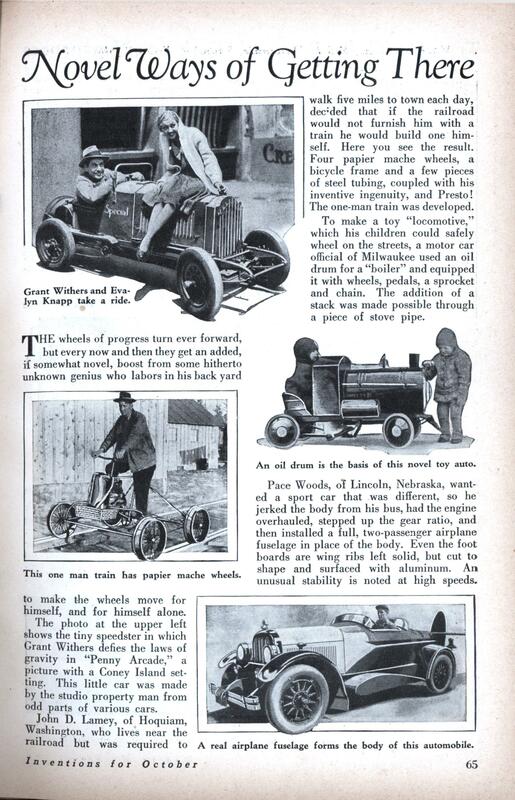 To make a toy “locomotive,” which his children could safely wheel on the streets, a motor car official of Milwaukee used an oil drum for a “boiler” and equipped it with wheels, pedals, a sprocket and chain. The addition of a stack was made possible through a piece of stove pipe. 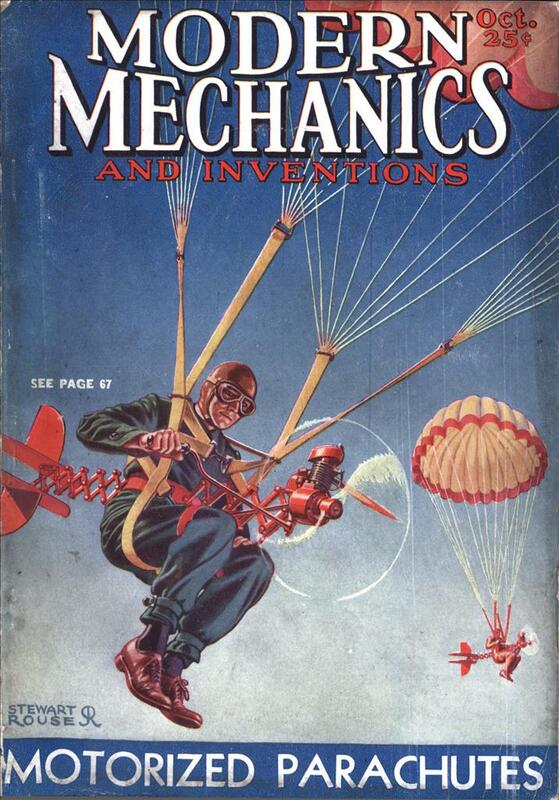 Pace Woods, of Lincoln, Nebraska, wanted a sport car that was different, so he jerked the body from his bus, had the engine overhauled, stepped up the gear ratio, and then installed a full, two-passenger airplane fuselage in place of the body. Even the foot boards are wing ribs left solid, but cut to shape and surfaced with aluminum. An unusual stability is noted at high speeds. “papier mache wheels”!? I’ed rather walk! I can’t help worrying about what would happen if he met a real train trying to use the tracks at the same time.